Nancy's Nook : Are you stressed out? If that wouldn't tune out the world I don't know what would. We were giving ear plugs and blackout eye-wear to Ryan and Laura (my daughter) for their overnight flight to Scotland, and well, I remembered seeing that above picture. So I showed it to them. That's Bailey Jo and Will (my son) ... when we were Facetiming them (like skyping) last Thursday. So right about now Laura and Ryan are getting ready to board their plane. And I'm sitting here wishing I could have hidden in their bag. 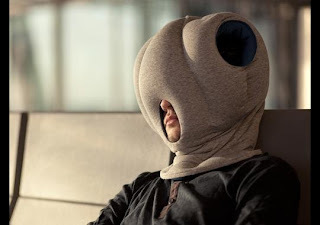 Hopefully those earplugs and blackout eye-wear we gave you will mean you can sleep on the plane. Me- I can never ever ever sleep on trains, planes, or automobiles. I guess I need to get that 'Ostrich Pillow' in the top photo for my next venture. Oh, Laura just texted me that they're on the plane!! Oh wait, I don't have to go. So fun! And yes we were able to get sleep, which I usually am never able to do on planes either. Ryan slept more than me, but we both got a good amount. At Heathrow now, just a few hours away from Glasgow! Thanks for everything!